This post is the second in our new series on drought, flood and water. Over the coming weeks we will make connections between AUSCCER researchers working on watery themes, and showcase our new books and articles. This week, Emily O’Gorman reflects on floods, as discussed in Flood Country: An Environmental History of the Murray-Darling Basin. During a research trip in May this year to the Murrumbidgee River region in inland NSW, the power of floods to shape landscapes, lives and livelihoods again became apparent to me. Floods had peaked along this and nearby rivers (like the Lachlan) a couple of months previously, and the effects of the floods – and in some places the water itself – still lingered. 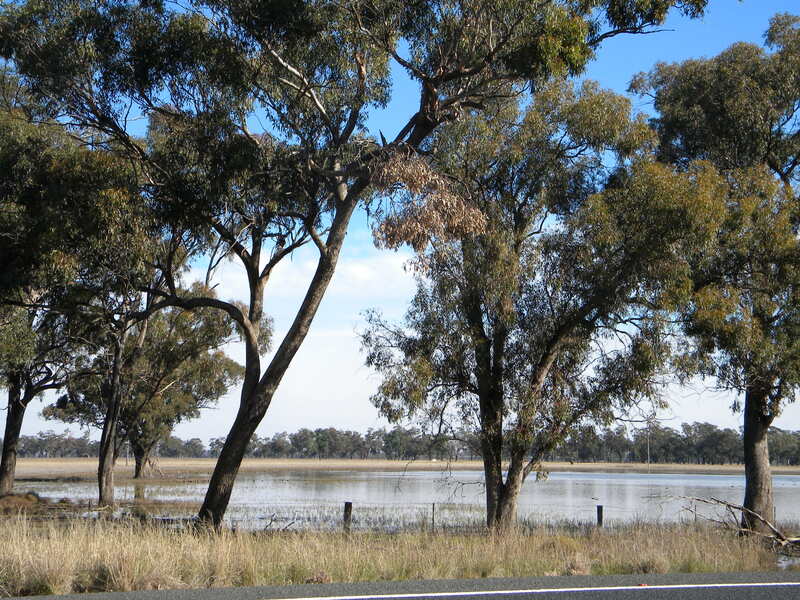 Near the town of Narrandera, water had pooled against the road embankments, creating ephemeral wetlands that some waterbirds were still visiting. The number and variety of parrots was staggering; the populations of foxes, too, had increased, evident in both the road kill and frequent sightings. It was an ecological ‘boom’ that has become a well known characteristic of floods in many places in Australia. The people I spoke to, mostly farmers, were noticeably more relaxed than during my previous research visits over the last two years to this particular area (and last seven years to different parts of the Murray-Darling Basin), which had included the tail end of a long drought that lasted in some places in this region for 10 years. Yet there were also stories and signs of the trouble floods had brought. The bitumen of some roads had been torn up and work crews were gradually making their way to each point of repair. On the radio, a group of farmers who lived near Yenda talked about the floods eroding large sections of river bank on their properties, an ongoing problem because the floods had also begun to change the river’s course which formed a property boundary. Parts of Wagga Wagga had flooded too and some areas had been evacuated, but the main levee of the town had held. Floods in this area had not very long ago also entered national politics. About a year and a half ago, floods through the Murrumbidgee and other rivers in the Murray-Darling Basin played into the politics surrounding draft documents for the Basin Plan. Following these floods, some people argued that many of the most pressing water use problems, particularly the over-allocation of river water for irrigation, were no longer critical and that the urgent action was no longer necessary. Dry ‘busts’ seem to be easily forgotten as the wet ‘booms’ set in. The power of floods is held in more than their peak height. Past floods, like more recent ones, have shaped our changing political, cultural and physical landscapes. Our contemporary approaches to floods – from farming boons to emergency management – and environments – from levee banks to full dams – are underlain by complex histories. Floods also enter into environments shaped by our past approaches to rivers more generally, which in turn have been deeply influenced by the capacity of many watercourses in the Murray-Darling Basin to intermittently dry (sometimes until they are completely dry) for a few years and then relatively quickly begin to overflow. Questions like, how do we live in a land dominated by drought and flood? or how should water and changing environments be managed?, are not new and their histories need to be considered in order to fully understand both the importance of floods and their cultural and material legacies, as well as to shape our future approaches to rivers and floods. In my new book Flood Country: An Environmental History of the Murray-Darling Basin, I trace some of these legacies and changing understandings of rivers, floods, and floodplains in this region over the last 160 years. The book begins with a chapter on a flood in the Murrumbidgee river town of Gundagai in 1852 that led to the town being moved to higher ground, and then ranges across the Basin with chapters on floods in Bourke, NSW, in 1890; Mildura, Victoria, in 1956; and Cunnamulla, Queensland, in 1990. Through these and wider ranging chapters I particularly examine two of the ways floods have been approached across this period. First, as major sources of water in dry regions, floods have been highly valued, sources of heated debate, and the rationale behind engineering schemes. Second, they have been seen as ‘natural disasters’, causing death and destruction. The idea of ‘natural disasters’ is deeply cultural, directly influenced by where and how we live and how we understand our places, especially how much damage is caused to built works and agriculture and how many human lives are lost. The label ‘natural disaster’ in some sense also classifies an event as unusual. But floods in Australia challenge such a classification. Although large floods are unpredictable in an absolute sense, they occur often enough, like bushfire, drought or storm events, that they are frequently followed by a retrospective sense of fatalism. But these events are then all too often quickly forgotten. Paying attention to the past is an important antidote to this pervasive, and often convenient, cultural amnesia. More on floods in three weeks time. Next Tuesday: Leah Gibbs writes on the materiality of water. And after that, Lesley Head on drought and climate change. This entry was posted in Drought flood water, Series, Water and tagged environmental humanities, flood, history, MDB by Emily O'Gorman. Bookmark the permalink. Emily O'Gorman is an Associate Research Fellow in the Australian Centre for Cultural Environmental Research at the University of Wollongong. She is the author of Flood Country: An Environmental History of the Murray-Darling Basin (CSIRO Publishing, 2012). Thanks for providing these details within your website.